The question can be posed, if circularity or squareness is the result of a spiritual approach or the outcome of pure practical reasons. The difference between an incidental or deliberate application of division-consciousness is at stake. Empirism (and its most faithful servant called Science) demands an answer here: is a structure objective (as given by nature, and outside our sphere of influence) or is a structure subjective (being the result of a deliberate action taken in the field of division thinking). What does a P4-symmetry of an architectonic structure or planological outlay really tells us about the intentions of its makers? The ‘four-fold way’, as a specific division approach to reality, might give an answer here, but the last word will not be unanimous. By its very nature multiple thinking will leave options open. Maybe that is the reason why this mental setting can be found all over the world. The devotion to tetradic thinking is everywhere and has always been present. The main difficulty – as far as interpretation is concerned – is the distinction between a product, which is the result of a deliberate effort to think in tetradic terms or an occurrence of the four-fold just by chance. Modern scientists are reluctant to discriminate between these two perspectives and often dispose of the whole matter as ‘numerology’ as soon as any form of division-thinking is mentioned. The fear of science to look into the subtlety between a natural, unconscious tetradic setting and an artificial, conscious approach is understandable, because there is nothing to ‘prove’. A historical example might help to elucidate this matter. Nobody can ever exactly probe the psychological depth of the dexterous Roman Emperor Diocletian (c. 236/237 – 316) when he restructured his Roman Empire along tetradic lines at the end of the third century. His state of mind can only be reconstructed from his political acts as recorded in such writings as the Scriptores Historiae Augustae or the information provided by the Christian writer Lactantius (in his book De Mortibus Persecutorum). Firstly, Diocletian made the trusted general Maximianus his Caesar in 285/286 and elevated him to the rank of Augustus in the spring of 286. Effectively, the rule of the Roman Empire was now divided in a western (Maximianus Herculius) and an eastern part (Diocletian). Then, in AD 293, the Caesars Galerius and Constantius I Chlorus (the latter affix meaning ‘the pale’) were instated as secondants to the co-emperors. The rule by these four men became known as the tetrarchy. It seems, but can never be scientifically proven, that this form of government was based on a genuine tetradic philosophy, in which a four-fold division of the mind was accepted and applied in real life. William SESTON (1946) indicated that the foundation of the tetrarchy was of a religious nature, with the belief in Mithraism as a possible source of inspiration. Furthermore, the relation between Jupiter and Hercules – as reflected in the additions to the names of the Augusti (Diocletian Jovius and Maximianus Herculius) – is given as a hierarchical element in the political structure of the tetrarchy. This concern with the power-aspect of the partitio imperii points to a dualistic outlook in Seston’s book. This method is approved in its own way, but it has to be realized that other points of view are possible. The tetrarchy can also be seen as a conscious and balanced system, which was not based on oppositional forces. The Quatuor Principes Mundi – with their equal distribution of importance (including power) – might be, in the long run, more effective than the short- time human drive to put things in opposition. This idealism, which is part and parcel of the tetradic outlook, must have intrigued Diocletian. Further ‘evidence’ for this latter suggestion can be found in the building of his place of retirement in Dalmatia. Emperor Diocletian abdicated in 305 AD and returned to his homeland. The voluntarily abolition of power was an unprecedented and courageous step, but calculated as well. The process of his succession could now be tested, while the initiator (Diocletian) was still alive. Maximian Herculius, his co-emperor, was more or less forced by Diocletian to abdicate as well, but he could not part of the addicting power play of lower division thinking. Further intrigues to regain his power (by an attempt to murder his son-in-law) led to his untimely death in July 310 AD, either by suicide or on the orders of the intended victim. Diocletian, on the other hand, stuck to his principles and had an impressive seaside palace build in Split (Spalato) (fig. 7). 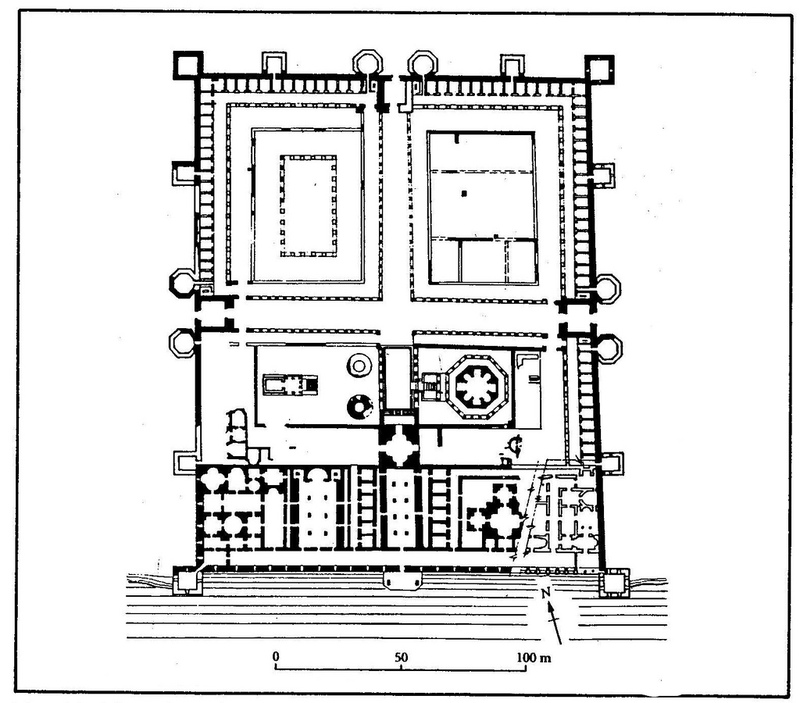 The outlay of Diocletian’s palace followed the design of a Roman military camp (or castrum). This well-known rectangular scheme was not very original at the time, but it must have appealed to a tetradic mind. The imperial mausoleum inside the walls, with its octagonal outlay, followed a tradition in the spirit if the (double) four-fold. Diocletian lived there in peace until his death in 316. Fig. 7 – The plan of the palace of Diocletian at Split (Dalmatia) was based on the tetradic outlay of the Roman army camps or castra. It was only after Diocletian’s mortal end that Constantine became the undisputed ruler of the Roman Empire. He allowed freedom of belief and encouraged the acceptance of Christianity. In this historical function, he became the hero of the Christians. Diocletian, on the other hand, is remembered as the last great persecutor of the Christians. His tetradic views to neutralize (any) power could not be hindered by a religious sect or foreign cult trying to seize power. However, in the fierce persecution of Christians – particular in the year 303 AD, when the destruction of all Christian churches and scriptures was ordered – Diocletian bit in his own tail. It is possible that his serious illness in AD 304 was the outcome of his illogical mission to propagate the tetradic philosophy by force. The comparison between a – potentially – ’genuine’ tetradic feature and a ‘numerological’ occurrence will now shift to an example of the latter, also derived from the Roman Empire. There is, in its rich and colorful history, the year 69 AD, known as the Year of the Four Emperors. This year was characterized by rather chaotic circumstances, resulting in the rule of four emperors in one year (GREENHALGH, 1975; WELLESLEY, 1989). Within one year, there were four emperors who put their marks on the history of Rome during a (second) period of Civil War (fig. 8). Fig. 8 – The year 69 AD was called the Year of the Four Emperors in the Roman cultural history. 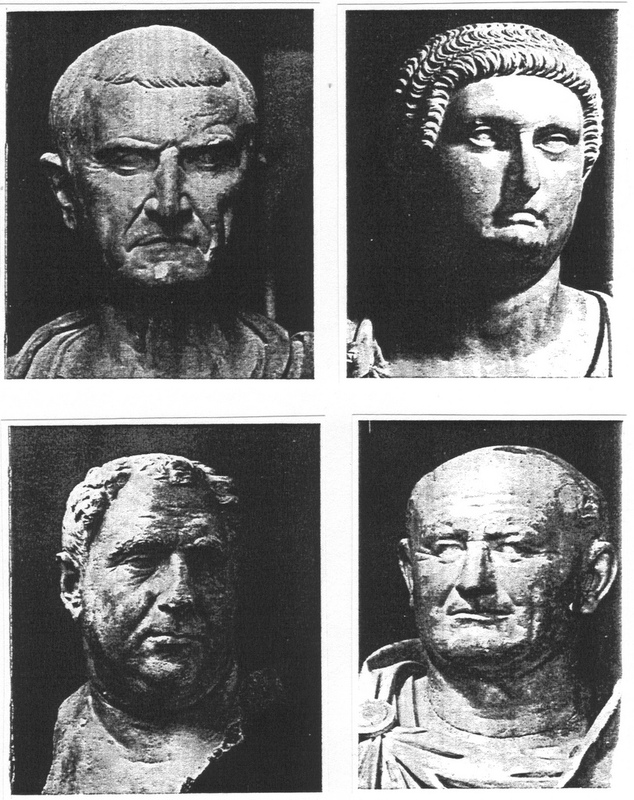 Top left: Galba (4 BC – 69 AD); top right: Otho (32 – 69 AD); bottom left: Vitellius (15 – 69 AD); bottom right: Vespasianus (9 – 79 AD). General Galba (4 BC – 69 AD), governor of Hispania Tarraconensis, was the first (of five generals leading separate revolts) to reach Rome after the death (by suicide) of Nero in AD 68 and proclaimed himself emperor. He started off on the wrong footing by refusing to pay soldiers the usual bonus as a new emperor. Furthermore, he angered his friend Otho by choosing another man as his heir. Otho turned his soldiers against Galba and the latter was killed in Rome on the 16th January 69 AD after a reign of seven months. Marcus Salvius Otho (32 – 69 AD) actions as a princeps in Rome lasted eight and a half weeks, although he was eager not to offend anyone (and compensated the soldiers for Galba’s stinginess). However, the revolting military legions in the Rhineland, supporting Vitellius, advanced towards Rome. The army of Vitellius started to build a bridge over the River Po (near Cremona) in order to drive southwards. Otho’s offensive against Vitellius failed, and he took his own life on 16 April 69. Now it was the turn to Aulus Vitellius (15 – 69 AD), the governor of Lower Germany, to restore peace. He had little military experience and had a reputation for gambling and gluttony. His appointment as governor – by Emperor Galba in late 68 – had been a surprise. Vitellius stayed behind when the legions of Upper Germany started their mars on Rome (under the generals Valens and Aulus Caecina Alienus). The Batavian auxiliaries won the First Battle of Bedriacum and Vitellius was hailed as emperor. He entered Rome in late June-early July, replaced the existing Praetorian Guard and urban cohorts with sixteen praetorian cohorts and four urban units, all comprised of soldiers from the German armies. However, discontent remained and peace was still not in sight. Trouble mounted when the legions of Egypt swore allegiance to a rival emperor, Titus Flavius Vespasianus (9 – 79 AD), a successful and popular general. They were joined by troops in Pannonia and Illyrium and made a rapid descent on Italy (under Antonius Primus, commander of the Sixth legion). The Flavian army fought its way into Rome and found Vitellius hiding in the imperial doorkeeper’s quarters. They dragged him from his hiding place to the Forum, where he was tortured, killed and tossed in the Tiber. The principate now passed to Vespasian, who was emperor for ten years (AD 69 – 79). He was the last emperor in the Year of the Four Emperors and was granted the imperial powers on December 22, AD 69. He died peacefully at Aquae Cutiliae on the 23 June AD 79 and was a conscientious administrator. He rebuilt the empire and established a positive working model for the ‘good emperors’ of the second century. This short resume of the ‘Year of the Four Emperors’ makes it clear that the name bears no reference to a four-fold way of thinking. It is just a curiosity in its own right to which the number four is attached. The conclusion is clear. The difference between a genuine tetradic issue and numerological serendipity is often not difficult to establish, but there are occasions that the difference is less clear – in particular in the subject of our present investigation, the architecture. A square building or room might be conceived as a representation of a tetradic outlook, but it can also be the outcome of rational and practical considerations rooted in a dualistic mind. Counting has a Janus face: it is either a deliberately process in which the actual numbers gain primary importance, or it is part of the a priori nature of division-thinking. The former approach is known as numerology, the latter is embedded in quadralectic continuity. Architecture, as it is seen today, is the outcome of many processes, both in the mind and on a practical level. Ruins of the past are being removed to lay the foundations of modern buildings. Only the intentions of the builders are left after everything is cleared. They can only be valued by someone living in the present, using a system of measurements, which is restricted by place and time and, above all: subjectivity. The present position is an acknowledgement of that situation. Quadralectic architecture is a specific aesthetic approach to building based on the principles of the quadralectic philosophy. This type of thinking includes the conscious and unconscious use of the four-fold division and regards the value of the subdivisions – in an overall picture – as equal. The main characteristic is the ability to grasp the four types of visibility at the same time. Application of this mental act means a more relative view on the oppositional forces in a communication. It implies that even the before-mentioned duality of ‘conscious versus unconscious’ changes from an oppositional state of mind into a wider vantage point. The search for the four-fold in architecture has to be aware of the above mentioned ‘relativity’. The tetradic features are everywhere and nowhere. A sudden occurrence of tetradic buildings in place and/or time does not necessarily mean that the architects and/or their patrons were driven by overly enthusiastic feelings for the four-fold way of thinking. It only proves that the visibility of the four-fold came to light, which can happen – in principle – in the whole visibility area of a communication. Any occurrence of tetradic features has to be placed in the context of a quadralectic communication-as-a-whole. The question remains if quadralectic architecture is a style of its own, playing in the same league as such familiar expressions like Gothic, Baroque or Neo-Classicism. The answer is negative. There is an inherent discrepancy between the ideas of tetradic thinking and the will to create an identity of its own. Or, expressed in the language of the quadralectic philosophy-itself: a supposed ‘struggle’ between the different types of visibility. The Third Quadrant (III), characterized by the visible visibility of the limited, aims at identity. The Fourth Quadrant (IV), with the visible invisibility of the boundless as a hallmark, is not primary interested in the boundaries, but also in the unlimited space in between. The ‘classical’ definition of an architectonic style was born in a process of making dualistic choices. Certain features were incorporated in the definition while others were not. The search for identity used an arsenal of established ‘tricks’, kept in a box of known stratagems and instruments. Style aims at the glamor of visible visibility, it wants to be seen and known. Style is hungry for publicity and recognition. Quadralectic architecture, on the other hand, does not need approbation to exist. It simply is, for those who are able to see the context of its being. Quadralectic architecture is not – and cannot be – an architectural style in the classical sense of the word. Its very own principles prevent the sharp outlines of a definition. However, there is, undoubtedly, a form of building, which celebrates the achievements of multiple division-thinking and captures the richness of the tetradic spirit in the material world. The search for this wealth of material, stocked in millions of buildings in past and present all over the world, will be the assignment for the rest of this book.